Jeff peacefully woke us up this morning by running around the gym with his American flag screaming, “IT’S 5 O’CLOCK! EVERYBODY WAKE UP! IT’S 5 O’CLOCK!” Needless to say, everybody woke up. Today is dedicated to the birthday girl, Linnea! She is a beast of a cyclist and such a sweetheart. She lost her father earlier this year, to the same kind of brain tumor my mother had. I will be riding for him, Chad Cripe, as well as Linnea and her family. Once again, I got my coffee fix at the first water stop – Lauren hooked it up today. Today was an awesome riding day. We started out with headwinds, but after maybe 20 miles, it was pretty smooth riding. It was sunny, but maybe 80 degrees out. 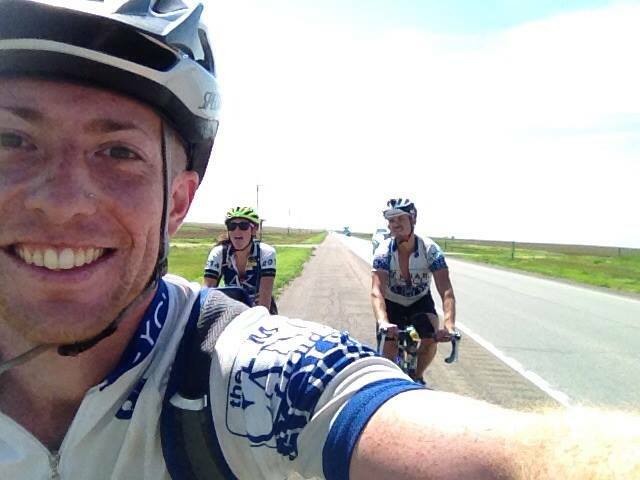 We all killed it, averaging 16 mph, and getting to our host, the Dodge City Fire Department, at around 1:30. For an 80 mile day, we had a blast and made amazing time. I’ve gotta get some sleep if I’m going to be able to ride a century and then celebrate all afternoon. Night!